Most of the current Peruvian territory is covered by the Amazon forest, comprising 60% of this country, it possess different types of forest, the Amazon River borne in its mountains called the Andes, and it`s the second largest country containing a big portion of the Amazon rainforest in South America, after Brazil. With a warm and tropical climate, the jungle has many attractions, landscapes, typical food and warmth hearted people who will captivate you with their joy and humble manners. Located in the heart of Peru’s northeastern jungle, we recommend you visit the Pacaya Samiria Natural Reserve with its “Forest of Mirrors” in the middle of the Amazon river, a place of exceptional beauty and one of the greater wealth of fauna and flora of the world yet in natural state in a 2 million hectares. 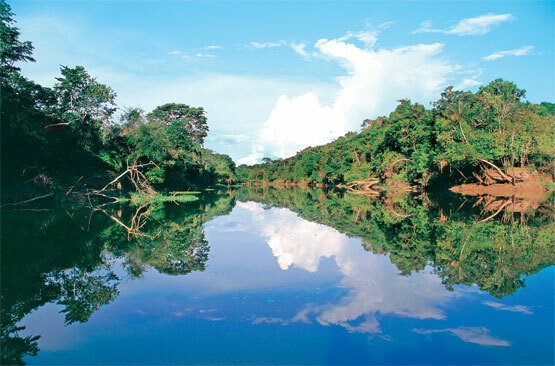 Located 180Kms of Iquitos, it`s the largest intangible natural reserve in Peru with a rich biodiversity. If you`re adventurous, stay around the reserve in one of it s many natural lodges for tourists with a native community, from which you can organize excursions and guided tours. 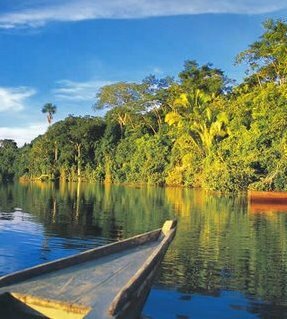 Just travelling inside it, you can start experiencing the real jungle in all its explendor, with a boat or cruise tour through Nauta George and lakes nearby to observe the flora and fauna, including primates, sloths, waterfowls, medicinal plants, pink and gray dolphins and much more. However, its main attraction is its clear waters beautifully reflecting the sky, clouds, and the streamside vegetation, large trees producing an incredible feeling of traveling between mirrors in the endless water jungle, hence it’s called, “The Forest of Mirrors.” At night you can stroll by boat to a creek in search of nocturnal animals and insects in the magic forest. You can also visit one of its 14 indigenous communities or groups, they`ll provide proper, sincere orientation, guide, food and accommodation. Around the year, its climate is tropical hot and humid, with minimum temperatures of 22 º C (72 F) and maximum 32 º C (88 º F), except in June where can drop as a result of cold winds from the south. Usually early mornings tend to be cool, being the heaviest rainfall months, between February and May. It`s recommended that visitors be vaccinated against yellow fever at least 10 days before your trip and bring plenty of long leaves, dark colors, thick clothes and repellent lotion, however it seems that nothing is working for this unique jungle mosquitoes. First you`ll visit the viewpoint at the Amazon River headwaters to observe nature before entering the jungle with an Amazon walk for bird watching, night hikes, medicinal plant identification, after try in groups maybe canoeing, fishing, or visit one native community nearby, although nothing is real near in the jungle, prepare yourself for long amazing and hot walks. It`s include accommodation, food in the middle of the jungle. The next days, you`ll visit the Japanese and banana plantations, boat excursions to Nauta Gorge a its native communities. There is no reason not to protect one of our beautiful heritage and world natural area, the Amazon jungle, not only because it represents 1.5% of the national territory, but also it constitutes one of the few protected flooded forest area in the world. Current problems like oil drilling has been occurring in the last 10 years (Believe it or not, it’s a crime but 72% of the Peruvian Amazon jungle is nowadays under oil exploration and production of experimental wildlife and flora concession) with an irreparable damages as the 2003 investigation by Jose Alvarez showed. In this report it says that for first time, it exists a small cemetery in Alto Vista Alegre community in Rio Tigre where were buried 21 children death by a fulminant hepatitis aggravated by the intake of highly contaminated with heavy metals from oil wells from the Occidental Petroleum company to fish and water where children play and eat. The Block 39 oil well is located in the heart of the most bio-diverse region in the world, rated as one of the most important eco-regions, but clearly not has being done by our government to protect it. This oil company, known as OXY (American) has been working in exploration, production and marketing of oil crude and natural gas since 2000, its operations are concentrated strongly in the Amazon greatly affect our communities, and Ecuadorian’s neighbors. This native group represent many native communities has blamed Pluspetrol Oil company for 6 oil spills in 2007 and by 18 more in 2008 among others. In Torata in January 26, 2009 when a tanker truck carrying 9,350 oil gallons from the city of Ilo, Bolivia turned in 9klms of the Binational highway spilling over 9,000 gallons of oil into the river beds of Huaracane & Chilligua rivers, which supply water to Moquegua and Ilo valleys and its people. Another incident, in January 10, 2009 just 45mins from Iquitos in Barrio Florido, a town with 1,500 inhabitants in the Amazon river, in one of its borders an oil refinery of PeruPetro Oil company the rain made spilt 4 oil barrels in the creek which later overflowed into the river causing rash and red spots on children`s skin who were bathing in the stream. So far, by 2009 this company has been responsible for other 16 oil spills in the heart of our Amazon without any further legal action, media coverage done by the Peruvian media. In 2006, the Peruvian Health Ministry report revealed that 98% of Corrientes River Basin children tested with an exceeded of lead and cadmium in their bloodstream, from whom 37% had high death risk. Consequently the Regional Director of Loreto`s Energy & Mine, Roy Meza told that had been sent medical teams to these communities and identified 2 people with stomach ailments, but still not confirmed due to the consumption of toxic agents. He recommended a monthly monitoring annually after 2010 in river waters, sediments, aquatic species and children`s blood in the affected population to evaluate the extent of this contamination. On the other hand, the native leaders are asked to minimize these events, as well as several criticisms have been introduced to the Peruvian State to fix inefficient acts and treatments to prevent more environmental damage by these companies. Food in the forest is characterized by its exotic taste in dishes, as well as variety of vegetarian options to travelers for its high use of native fruits and veggies in its preparation, all natural and fresh homemade to dazzle the most exquisite taste. 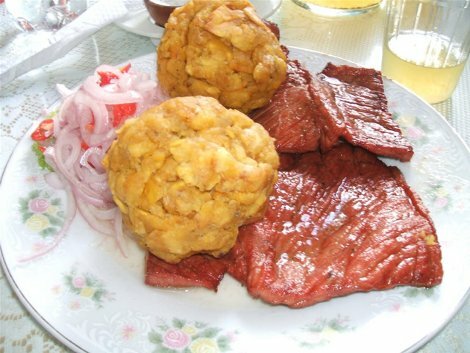 If you’re traveling there you cannot miss to taste, Tacacho with Cecina, a dish of dried beef or pork served with a mixture of fried bananas and cavassa, another dish is Juanes, a combination of rice with chicken wrapped in banana leaves, Soup of Mono or Suri, which are water source tree worms with very important nutrients. The peculiarity of these dishes is their collection of exotic traditional food produced by natives in this beautiful region, that`s why the President of the Culinary Academy of France, Gérard Dupont has signed an agreement with Peru to host students exchange from cooking schools. To quench your thirst, in this intense heat, you have great variety of drinks made with fresh fruit juice like Cocona, aguaje, palm tree, star, banana, pineapple, etc. all highly nutritious, and natural. Additionally if you want to try new sensations, there are a great variety of alcoholic-medicinal, exotic drinks like Seven Roots, Uvachado, RC, etc, known to many healing properties. On the other hand, you can also test various medicinal herbs recognized globally like Uña de Gato, Sangre de Grado, known for their use as antiviral, anticancer, anti-rheumatic, etc properties. One of the myths often tell is related to walks in the jungle and the appearance of someone called “The Tunche”, the legend says that he’s a demon lose in pain in the exotic jungle who kills anyone who enters too deep, and grabs their soul once the person is in trouble, he slowly approaches their victims with no sound and when it`s near, he whistles announcing the imminent death of the listeners. Those who have miraculously survived, say that the Tunche come alive under the image of a victim`s acquaintance or in form of constant light, so it isn`t a total surprise. The Yacuruna: A water man who comes to the surface in the lakes, rivers or water beds to kidnap women who he likes to live in him in the depths. He has been described as human but with his face backwards. The Yara: It`s a mermaid who lives in the river depths and lakes in the jungle, it`s a demon who attracts men and leads them to death. It`s been described as a beautiful woman with perfect shape, blond hair, blue eyes and pearly skin but with a flip like a fish. La plus grande partie du territoire actuel péruvien est couvert de bois amazoniens, comprenant 60 % du pays. C’est l’unique pays qui possède différents types de forêt, c’est le lieu où l’Amazone prend sa source dans les montagnes andines, et le deuxième pays possédant la plus grande surface de forêt amazonienne sur son territoire, après le Brésil. Ceci nous oblige à développer le tourisme dans toute la région amazonienne, en offrant et promettant d’inoubliables expériences dans les diverses villes qui composent le territoire amazonien. Avec un climat chaud et tropical, la forêt possède de nombreux enchantements, comme ses paysages, ses lieux touristiques, la nourriture typique et l’amabilité des gens. Vous serez captivés par leur joie dès les premiers instants. Iquitos se situe en plein cœur de la forêt nord-orientale péruvienne. Si vous aimez l’éco-tourisme, nous vous recommandons de visiter cette ville où l’on peut visiter la Réserve Nationale Pacaya Samiria ou la «forêt des miroirs», lieu d’une exceptionnelle beauté, et un des lieux avec la plus grande richesse de faune et de flore du monde à l’état naturel et de conservation. Il s’étend sur 2 millions d’hectares, se trouve à 180 km d’Iquitos. C’est la zone intangible la plus grande du Pérou, elle comporte des paysages d’une grande beauté et diversité. Si vous êtes aventurier, il existe aux alentours de la réserve des auberges pour touristes, depuis lesquels peuvent être organisées des visites ou excursions guidées. Aussi on peut visiter la Réserve Pacaya Samiria, grâce à des croisières organisées depuis Iquitos ou Nauta, et vivre une expérience inoubliable, en navigant sur le fleuve Amazone. Si vous vous trouvez à Iquitos, n’hésitez pas à visiter cette sensationnelle réserve dans laquelle vous pourrez expérimenter la vie dans la forêt grâce à une excursion en bateau sur la Rivière Nauta et les lacs voisins, où vous pourrez y observer la flore et la faune, de même que les primates, les paresseux, les oiseaux aquatiques entre autres, mais aussi les plantes médicinales. Vous pourrez vous loger dans de confortables et exotiques auberges ou gîtes. 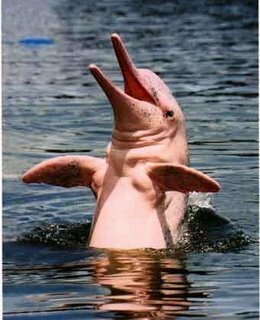 Dans la Réserve, vous pourrez observer les dauphins roses et gris du fleuve Yanayacu, vous serez en contact avec l’immense variété de flore et faune qu’offre la réserve. L’attraction principale sont les eaux du fleuve qui reflètent avec une grande fidélité le ciel, les nuages, la végétation des berges et des grands arbres…ce qui produit une sensation incroyable de naviguer entre des miroirs interminables, d’où son nom « La forêt des miroirs ». La nuit, vous pourrez vous promener en bateau sur de petits ruisseaux à la recherche d’animaux nocturnes et d’insectes, et vous y expérimenterez la magie de la forêt la nuit. Vous pourrez visiter aussi diverses communautés indigènes qui vous indiquent de manière sûre les meilleurs moyens de transport, les guides, l’hébergement, la nourriture. Le climat tropical est chaud et humide, avec des températures minimales de 22ºC et des maximales de 32ºC, sauf au mois de juin où la température peut baisser, en conséquence des vents froids provenant du sud. Il fait en général assez froid le matin, et nous ne sommes jamais à l’abri de la pluie, surtout entre février et mai. Même si ce n’est pas obligatoire, il est recommandé que le visiteur soit vacciné contre la fièvre jaune au moins dix jours avant de voyager. Tour durant lequel vous pouvez visiter le belvédère qui surplombe la naissance du fleuve Amazone, observer et être en contact avec la nature amazonienne, faire des randonnées en forêt, observer les oiseaux et les plantes médicinales, faire des excursions nocturnes ou en canoë, partir à la pêche artisanale, visiter des communautés natives. L’hébergement se fait dans des auberges exclusives et accueillantes au milieu de la nature en pension complète. Vous visiterez aussi les lacs Japon et Plantano et ferez une excursion en bateau sur la rivière Nauta. Visitez le Belvédère qui surplombe la source du fleuve Amazone, on vous propose des excursions en bateau, la visite d’une rivière riche en faune et en flore, l’observation d’oiseaux, la pêche artisanale avec les piranas notamment, la recherche et la contemplation des dauphins roses, une nuit de campement, une excursion nocturne, la visite de communautés natives. L’hébergement se fait dans des auberges exclusives et accueillantes au milieu de la nature, en pension complète. Vous visiterez aussi la Réserve de Pacaya Samiria, le Nauta Caño. Les raisons pour protéger un de nos patrimoines et orgueils péruviens sont innombrables. Non seulement elle représente 15% de la superficie du Pérou, mais en plus elle constitue la zone de bois inondables protégés la plus étendue d’Amazonie. Nous devons nous sentir très fiers et la valoriser pleinement. Depuis 10 ans, on rencontre des problèmes comme l’exploitation du pétrole dans cette zone. En 2010, 72% de l’Amazonie Péruvienne est en concession pour l’exploitation et l’extraction de carburants, ce qui produit de nombreux problèmes irréparables dans la faune, la flore et les communautés indigènes. Comme par exemple, en 2003, une recherche de José Alvarez a montré un petit cimetière dans la communauté de Vista Alegre dans le Haut Fleuve Tigre, dans lequel on a retrouvé 21 corps d’enfants enterrés, tous affectés par une hépatite foudroyante, aggravée par la prise de poisson et eau contaminés avec des métaux lourds déversés par un puits de pétrole de l’Occidental Petroleum dans le lot 39. Le cœur de la région ayant la plus grande biodiversité du monde est ainsi affectée, mais bien sûr, rien n’est fait pour la protéger. Occidental Petroleum, plus connue sous le nom de OXY, est une entreprise américaine qui travaille dans l’industrie du pétrole pour l’exploitation, la production et la commercialisation du pétrole brut et du gaz naturel. Ses zones d’exploitation se concentrent principalement dans l’Amazonie, en affectant considérablement notre territoire et les communautés voisines, ainsi que l’Equateur. A rendu responsable l’entreprise Petrolière Pluspetrol de 6 déversements de pétrole en 2007 et de 18 en 2008, entre autres à Torato, le 26 janvier de cette année. Un camion citerne bolivien qui transportait 9350 galons de pétrole depuis Ilo jusqu’au pays voisin s’est renversé à la hauteur du kilomètre 94 de la route binationale, à Torata, déversant tout le pétrole dans le lit des rivières Chiligua et Huaracane, lesquels approvisionnent en eau toute la vallée de Moqueagua et Ilo. De la même manière, le 10 janvier 2009, dans le fleuve Amazone à 45 minutes d’Iquitos se trouve Barrio Florido, un centre peuplé de 1500 habitants qui se consacrent à la pêche. Ce village est établi à côté d’une rivière limitrophe avec la rafinerie de Petro-Perú. La pluie fit que 4 barrils de pétrole glissèrent dans la rivière ce qui provoqua des éruptions cutanées et des allergies sur la peau des enfants qui se baignaient dans cette rivière. En 2009, ils ont tenu pour responsable cette même entreprise de 16 déversements de pétrole en plein cœur de notre Amazonie sans en avoir informé les médias Péruviens. En 2006, un dossier du ministère de Santé a révélé que 98% des mineurs examinés dans le bassin du Corrientes étaient au dessus des quantités limites acceptables de plomb et cadmium dans le sang. Parmi eux, 37 % présentait des hauts risques de mort. Avant cela, le directeur régional d’Energie et Mines de Loreto, Roy Meza a informé IPS qu’on avait envoyé des brigades médicales aux communautés, et on a identifié deux personnes avec des maux d’estomac, mais il n’a pas été confirmé si c’est à cause de la consommation d’agents toxiques. Sotero recommande un moniteur mensuel tout au long de l’année depuis 2010, dans les eaux, les sédiments, les espèces hydro biologiques et le sang de la population affectée pour réaliser une évaluation du taux de la contamination. D’un autre côté, les leaders natifs des communautés touchées demandent que les faits ne soient pas minimisés. Diverses critiques se sont implantées dans l’Etat Péruvien pour avoir un mécanisme de compensation aussi inefficient, empêchant de faire payer des amendes pour les dégâts causés à l’environnement par ces entreprises, puisque des 290 sanctions imposées par Osinergmin Perú aux entreprises polluantes, seulement 111 sanctions ont été payées. On voit donc apparaître un futur incertain et désolant. La gastronomie de la zone forestière se caractérise par ses potages et boissons exotiques, qui conviennent autant aux voyageurs, convives, que végétariens, puisque la cuisine utilise en grande quantité les fruits originaires du lieu, des produits naturels préparés « maison », qui enchantent le palais. Si vous pensez voyager, vous ne pouvez pas passer à côté du Tacacho con Cecina, une nourriture à base de viande sèche de bœuf ou de porc, accompagné d’un mélange de bananes frites. Aussi le Juane, une combinaison de riz et de viande de poule enveloppée dans des feuilles de bananiers ou d’arbres tropicaux. Si vous n’avez pas froid aux yeux, essayez la Soupe de Singe ou le Suri, vers d’arbres riches en nutriments. La particularité de ces plats est que vous ne pouvez pas les trouver ailleurs dans le monde. Cette cuisine est reconnue comme étant un ensemble de plats typiques exotiques, élaborés à base de fruits, de viandes originaires du lieu et de préparations natives de cette belle région. C’est pour cela que le Président de l’Académie Culinaire de France, Gérard Dupont, a signé un accord avec le Pérou pour patronner des échanges d’étudiants cuisiniers entre le Pérou et la France. Pour calmer la soif dans cette chaleur étouffante, il y a une grande variété de rafraîchissements à base de fruits frais comme le Jus de cocona, aguaje, carambola, etc., tous très nutritifs, naturels et ayant un apport en protéines. Si vous souhaitez expérimenter de nouvelles sensations, vous pouvez essayer les boissons exotiques comme Sept Racines, Uvachado, RC, etc, connus pour maintenir la vigueur sexuelle jusqu’à la fin de vos jours. En plus, il vous sera possible d’essayer diverses plantes médicinales reconnues au niveau mondial, comme la Uña de Gato, La Sangre de grado, utilisées comme antiviral, anti rhumatismes, anti cancérigènes, etc. Un des mythes les plus racontés et respectés par les guides touristiques dans la forêt est l’apparition d’un être appelé «Le Tunche». La légende dit qu’il s’agit d’un démon errant au sein de la forêt, qui prend la vie de celui qui entre trop profondément dans l’épaisse et mystérieuse végétation. On raconte que cette âme appartenait autrefois à un homme tourmenté, devenu maintenant complètement démoniaque. Il s’approche lentement de ses victimes sans émettre le moindre son, et lorsqu’il est proche d’elles, il siffle, annonçant la mort imminente de celui qui l’écoute. Ceux qui ont survécu par miracle indiquent que le Tunche prend l’image d’une connaissance de la victime ou de lumières incessantes par exemple, de façon à ce que la surprise soit totale. Son sifflement déchirant poursuit celui qui chercher à s’échapper, et au fur et à mesure que le Tunche s’approche, le volume du sifflement augmente. Ainsi, plus vous courez, plus vous sentirez sa présence près de vous, et plus il sera difficile de lui échapper. CHULLACHAQUI: C’est un petit démon capable de se transfigurer en n’importe quel être humain ou animal forestier. On le reconnaît car il a deux pieds différents : un côté humain, et un autre de capricorne. On le rencontre dans l’épaisseur de la forêt, où il se fait passer pour un faux guide pour que les promeneurs se perdent. Il émet des bruits, des cris, des voix et des grondements typiques de la forêt. YACURUNA: Homme d’eau, qui vient à la surface pour enlever les femmes qui sont à sa convenance et les emmener pour vivre avec lui dans les profondeurs des rivières. On le décrit comme un être humain, mais ayant le visage à l’arrière. YARA: C’est une sirène qui vit dans les profondeurs des rivières et des lacs de la forêt. C’est un démon féminin qui attire les hommes et les emmène vivre avec elle. Elle est décrite comme étant une très belle femme, avec un corps parfait, les cheveux blonds et les yeux bleus avec une peau de nacre. La mayor parte del actual territorio peruano está cubierto por Bosques Amazónicos, abarcando un 60% de nuestro pais, siendo el único país en poseer diferentes tipos de selva, por nacer el Rio Amazonas en las montañas de sus Andes y el segundo país con mayor extensión de Amazonia luego del Brasil. Con un clima cálido y tropical, la selva posee muchos encantos como sus paisajes, lugares turísticos, la comida típica y el calor de la gente, que te cautivara con su alegría en primera instancia. Ubicada en pleno corazón de la selva nororiental peruana, te recomendamos visitar la Reserva Nacional Pacaya Samiria o la “Selva de los Espejos” en pleno Rio Amazonas, lugar de excepcional belleza y uno de los lugares de mayor riqueza de fauna y flora del mundo en estado natural y de conservación, tiene 2 millones de hectáreas. Se ubica a 180Kms de Iquitos. Constituye la zona intangible más grande del Perú con paisajes de excepcional belleza y una gran biodiversidad. Si eres aventurero, en los alrededores de la reserva existen albergues y lodges para turistas, desde los cuales se pueden organizar visitas y excursiones guiadas. Primero visitas el mirador en la naciente del Río Amazonas, observación y contacto con la naturaleza Amazónica, caminatas en la selva, observación de aves, excursiones nocturnas, identificación de plantas medicinales, paseos en canoa, pesca artesanal, visita a una comunidad nativa. Alojamiento en Lodges exclusivos y acogedores rodeados de la naturaleza y alimentación incluidos. Dentro del tour se visitarán las lagunas Japón y Plantano, se realizara excursión en bote por la Quebrada Nauta y visitarán a una comunidad nativa del lugar. No existen razones para no proteger una de nuestras hermosas herencias y orgullo peruano, no solo representa el 1.5% de la superficie nacional del Perú sino que también constituye el área de bosques inundables protegidos más extensos de la Amazonía. Problemas como la explotación del petróleo en esa zona se han producido desde hace 10 años, en 2010, un 72% de la Amazonía Peruana está concesionada para explotación y extracción de hidrocarburos produciendo problemas en la fauna, flora y comunidades indígenas irreparables como por ejemplo en el 2003, una investigación de José Álvarez mostró un pequeño cementerio en la comunidad Vista Alegre en el Alto Río Tigre donde se encuentran enterrados 21 niños, todos ellos afectados por una Hepatitis fulminante que luego se demostró había sido agravada con la ingesta de pescado y agua, altamente contaminados con metales pesados vertidos por un pozo petrolero de la Occidental Petroleum, privada en el Lote 39 en el corazón de la región más biodiversa del mundo, calificada como una de las eco regiones más importantes del mundo, pero claro no se está haciendo nada para protegerla. Occidental Petroleum más conocida como OXY es una empresa estadounidense que trabaja en la industria del petróleo en la explotación, producción y comercialización del petróleo crudo y gas natural, sus zonas de explotación se concentran con mayor fuerza en el Amazonas afectando considerablemente nuestro territorio a las comunidades vecinas, así como también en el país vecino ecuador. Esta a responsabilizado a la Empresa Petrolera Pluspetrol por 6 derrames de petróleo en 2007 y por 18 derrames en el 2008 entre ellos Torata el 26 de enero del mismo año. Un camión cisterna boliviano que transportaba 9.350 galones de petróleo desde Ilo al vecino país, volcó a la altura del kilómetro 94 de la Carretera Binacional, en la localidad de Torata derramando más de nueve mil galones de petróleo sobre el cauce de los ríos Chilligua y Huaracane, los cuales abastecen de agua a todo el valle de Moquegua e Ilo, Asi mismo el 10 de enero del 2009 en rio Amazonas a 45 minutos de Iquitos se ubica Barrio Florido, un centro poblado con 1.500 habitantes dedicados a la pesca, y que está asentado al lado de una quebrada que limita con la refinería de Petro-Perú. La lluvia hizo que cuatro barriles de hidrocarburos se rebalsaran en la quebrada y como consecuencia el agua de la causando sarpullido y manchas rojas en la piel a los niños que se bañan en esta quebrada. En lo que va del 2009 se ha responsabilizado a esta misma empresa por 16 derrames de petróleo en pleno corazón de nuestra Amazonia sin tener ninguna mayor difusión en los medios Peruanos. En el 2006, un informe del Ministerio de Salud reveló que un 98% de los menores de edad examinados de la Cuenca del Corrientes superaban los valores límite de plomo y cadmio en la sangre, de ellos, un 37% presentaba altos niveles de riesgo de muerte. Ante este hecho el director regional de Energía y Minas de Loreto, Roy Meza, informó a IPS que se han enviado brigadas médicas a las comunidades y que se identificaron dos personas con males estomacales, pero aún no se confirma si es por consumo de agentes tóxicos. Sotero recomienda un monitoreo mensual a lo largo del año, y anual, después de 2010, en agua, sedimentos, especies hidrobiológicas y sangre de la población afectada para realizar una evaluación del alcance de la contaminación. Por otro lado los líderes nativos de las comunidades afectadas piden que no se minimicen estos hechos. Diversas críticas se han implantado al Estado Peruano por tener un mecanismo de compensación tan ineficiente impidiendo cobrar multas por daños al medio ambiente por estas empresas ya que de las 290 sanciones impuestas por Osinergmin Perú a las empresas contaminadoras, hasta el momento solo ha podido cobrar 111 sanciones, esto se ve como un futuro incierto y desconsolador. La comida de la selva se caracteriza por sus exóticos potajes y bebidas, tanto para todo comensal como para vegetarianos o viajeros, por su alto uso en sus comidas de frutas oriundas del lugar, productos naturales con una preparación casera que encandilan el paladar más exquisito. Si vas a viajar no puedes perderte de probar el Tacacho con Cecina, una comida a base de carne seca de res o de chancho acompañado con una mezcla de plátano frito. También el Juane, una combinación de arroz con gallina envuelta en hojas de plátanos de arboles amazónicos. Si eres un poco más osado no dudes probar la Sopa de Mono o El Suri, que son gusanos del árbol del aguaje y que prometen importantes nutrientes. La peculiaridad de estos platos es que no los vas a encontrar en otra parte del mundo, siendo reconocida su cocina como un conjunto de comidas típicas exóticas producidas a base de frutas, carnes oriundas y preparaciones nativas de esta región hermosa. Es por ello que El presidente de la Academia Culinaria de Francia, Gérard Dupont, ha firmado un convenio con el Perú para auspiciar intercambios de estudiantes de escuelas de cocina, entre el Perú y Francia, a fin de que efectúen pasantías en escuelas y/o restaurantes del país anfitrión, para lograr el aprendizaje de preparación de diversos platos peruanos y compartir conocimientos de técnicas y procesos de la cocina francesa. Para calmar la sed, en ese intenso calor, tienes gran variedad de refrescos hechos a base de frutas frescas del lugar como el Jugo de cocona, aguaje, carambola, etc., todo muy nutritivo, proteínico y natural Si deseas experimentar nuevas sensaciones puede intentar probar con sus Tragos Exóticos como Siete Raíces, Uvachado, RC, etc, conocidos por mantener el vigor sexual hasta el final de sus días. Por otro lado también podras probar diversas Hierbas Medicinales reconocidas al nivel mundial como la Uña de gato, Sangre De Grado, conocidas por su uso como antiviral, antireumática y anticancerígena, etc. Uno de los mitos muchas veces contado y respetado por los guías en la Selva es la aparición de un ser llamado “El tunche”, la leyenda dice que es un demonio que vaga en pena a través de la exótica selva, y cobra la vida de todo aquel que se interne demasiado en la espesa vegetación. Cuenta la historia que esta alma antes fue un hombre atormentado y que ahora, completamente demoníaca se acerca lentamente a sus víctimas sin emitir sonido alguno y, cuando ya está cerca de aquellos que vagan solos por la selva, silba, anunciando la muerte inminente del que lo escucha. Aquellos que por milagro han logrado sobrevivir, indican que el Tunche cobra vida bajo la imagen de algún conocido de la víctima, o bajo otras formas como luces incesantes por ejemplo, de tal manera que la sorpresa es total. Su desgarrador silbido persigue al que corra de él, y a medida que se va acercando su volumen aumenta, así que por más que corras, sentirás su presencia cada vez más cerca de la cual no escaparás. CHULLACHAQUI: Es un pequeño demonio capaz de transfigurarse en cualquier humano o animal silvestre, está caracterizado por tener pies desigual, un lado humano y otro de caprino. Se encuentra en la espesura del bosque como falso guía para extraviar a los caminantes, modula voces familiares, rumores y gritos de la sinfonía selvática. YACURUNA: Hombre del agua que sale a la superficie para raptar a las mujeres de su agrado y llevarlas a convivir en las profundidades de los ríos. Se le describe como un ser humano pero con la cara hacia atrás. YARA: Sirena que vive en las profundidades de los ríos y lagos de la selva, es una demonia que atrae a los hombres y se les lleva a convivir. Es descrita como una bella mujer de formas perfectas, cabellos rubios, ojos azules y piel de nácar.